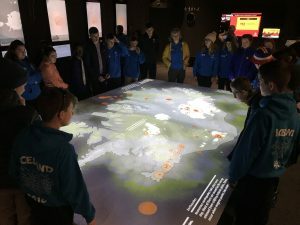 To start off the day, we travelled to the Lava museum in Hvolsvöllr and watched a 5 minute film about all the different volcanoes that have affected the area. The cinema was brilliant because we had little beds to lie on! We then went around the shop and cafe to purchase some souvenirs and drinks. After this we went down to the lagoon, which was formed due to the interglacial period, and failed miserably at skipping rocks. Once we had retreated back to the bus, we travelled down to the black sands beach near Vik, which was stunning… although we also got brutally attacked by the wind and cold. 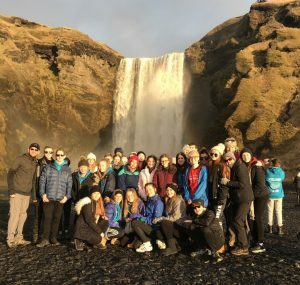 The black sand was formed because of the dark coloured rocks and volcanic nature of Iceland, which forms breathtaking and captivating sights and formations. We stood on the columns to take some daring photos! Finally, we stopped at a little town with some adorable shops!! Naturally, most of us spent a lot of money on souvenirs and food. Although Friday was our last day, we were so incredibly happy and lucky to have experienced such wonders. We are so thankful for this opportunity and everyone who made this happen! After a refreshing nights sleep, day two of Iceland awaited us. Starting off with breakfast, tasty options of: bacon, sausage, egg and beans, a variety of fruit and cereal. 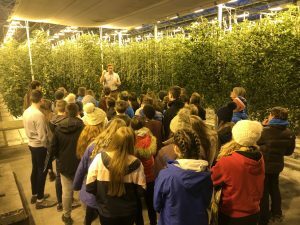 We made our sandwiches, packed our bags and hopped onto the bus to go to the greenhouse. This is where tomatoes are grown by a man and his family using hydroponics to grow them, using bees from Holland to pollenate the plants. The tomatoes were pretty good, but now it was time for the Golden Circle Tour. 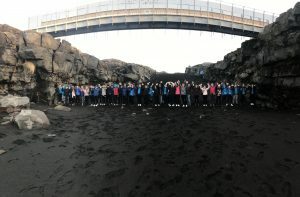 The Golden Circle was amazing! We saw the main famous geyser Strokkur, but most importantly the lighting was perfect for a selfie. 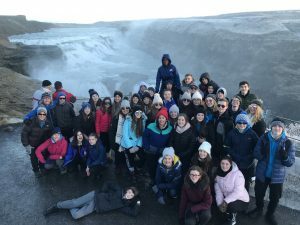 After this we visited the Gullfoss waterfall, which was an amazing sight to see! It was quite cold as we went down the path to get a closer look, and we visited some small gift shops. 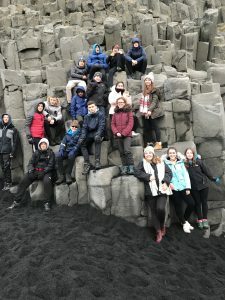 Always entertained by some lovely singing from our tour guide on the bus journey, we then went to visit another waterfall then got some pictures of us sitting in the gap between the tectonic plates of North America and Eurasian. Next stop, Keriõ Crater. This is a dormant volcano, and luckily it didn’t explode while we were there! We stopped at the local shop, bought some food and drink and went back to the hotel to chill for a bit and have tea, lovely pasta and tomato soup. We finished the night with a swim in the (freezing) pool with two hot tubs, then finished snuggled up with our pjs. 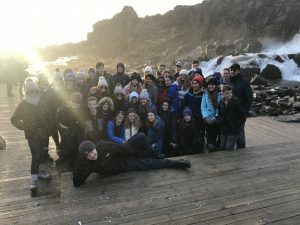 Day 1 of Iceland, most of us have had hardly any sleep because we were all too excited to get on the bus to travel down to Manchester and get on a flight to ICELAND. As soon as we got to the airport everyone went mental the excitement took a hold of us. We boarded our plane and most people slept but some people were just too excited. We landed in Reykjavik and we all got on the bus and went on an adventure. 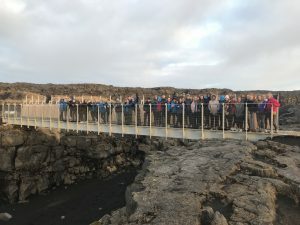 Our first stop was a constructive plate boundary which runs though the centre of Iceland. 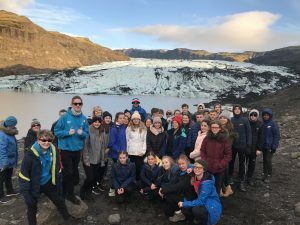 Then we travelled to the blue lagoon. It. Was. Incredible. The sights you could see were amazing and we were offered the chance to pamper ourselves with a luxury mud facemask after a long day of traveling. When we were finished at the Blue Lagoon we visited a Lutheran church and a music hall, the architecture was insane! We then travelled to the hotel. It was beautiful but we were all so tried after a long journey we had our tea and went off to bed.